This article gives overview about various ways to boost mobile ordering sales by applying a excellent digital marketing strategy. The priority of every business owner is to make sure all things are going on well and are in optimal conditions, with the business running itself and also generating profit at the same time. The focus has shifted from not only owning a website but also owning a responsive and mobile friendly website as research have shown that most active internet users today access the internet from their mobile devices and the statistics continue to grow each month. With this in mind, various methods have to be put in place to cater for the effective harnessing of this opportunity in driving sales to the mobile ordering system; you will find the money where the crowd is. This has to do with how you can create a user-friendly experience for those who visit your website from the start to finish till they make a purchase. Part of what you would want to consider is making your website optimised for mobile devices as earlier stated; this would include reducing the tiles and refactoring other features on your site to make it suit the mobile environment. What you get when your site is optimised is that you get more mobile users trooping into your site and that makes it a whole more accessible to make purchases because it is just some buttons away. Another useful functionality you might want to consider adding to your digital marketing services is the use of chatbots to enable a more personalised experience with users. The chatbots can be programmed to have all information about your product and help attend to multiple clients at the same time; this makes it easier to create awareness to potential buyers and also boost your ordering sales. Also, people like the ease and when you include a feature such as a QR code scanner to allow for secure payment, people get more interested in what you offer when it comes with a bit of comfort. Imagine just having to scan a code and pay for a $10 item; this feature helps boost your sales immensely. This is also something that is very important if you want to have an increase in sale and also have a multiplier effect. What you get with a personalised app for your business is that you connect more with your customers and also give them a sense of belonging in affecting your business. What you can explore with a mobile app are limitless, you can set up a reward system and slash prices for all mobile users or even possibly use geo-fencing to notify and reward customers that come within a mile to your store, with little incentives like this customers trust you more and would like to continue to purchase with you. Website Developers India is an excellent mobile app development company building mobile app idea on all leading mobile platforms and make it works smoothly and continuously on any mobile devices. 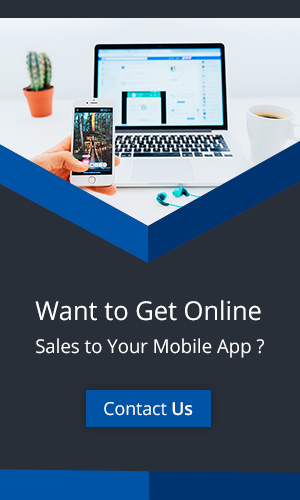 An excellent strategy would drive your sales to the top, and you would remain there if you properly maintain it by doing various things, one of which is running mobile ads for mobile users to get notified within apps they use about your store or directing them to download your app. If this proves successful, then you are a step away from further boosting your sales and keeping it afloat.